Do you like Bottle Flip Challenge 2? Share it with your friends. 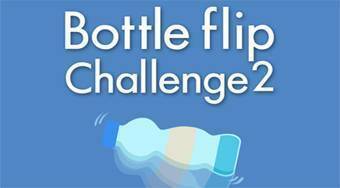 Bottle Flip Challenge 2 is the second part of a very addictive perception game where it's your job to throw different types of plastic bottles into the air so they can rotate in the air and always fall back down to the ground. With the game, you'll get new bottle shapes, and it's up to you to be patient, how much you'll eventually score points.